Developing frontline workers is highly correlated with market performance. Here's how to take advantage. 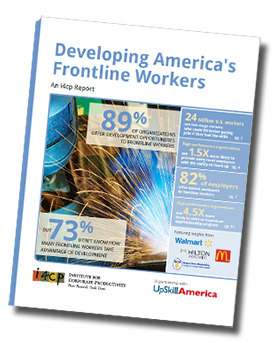 Research by i4cp and the Aspen Institute's UpSkill America found that while 89% of organizations currently offer development opportunities to frontline workers, the vast majority of organizations (73%) either don't track or report on the number of frontline workers who take advantage of these development opportunities. And yet, when frontline workers take advantage of development opportunities, it has a high correlation to the market performance of the organization. i4cp members - click here to get the report.